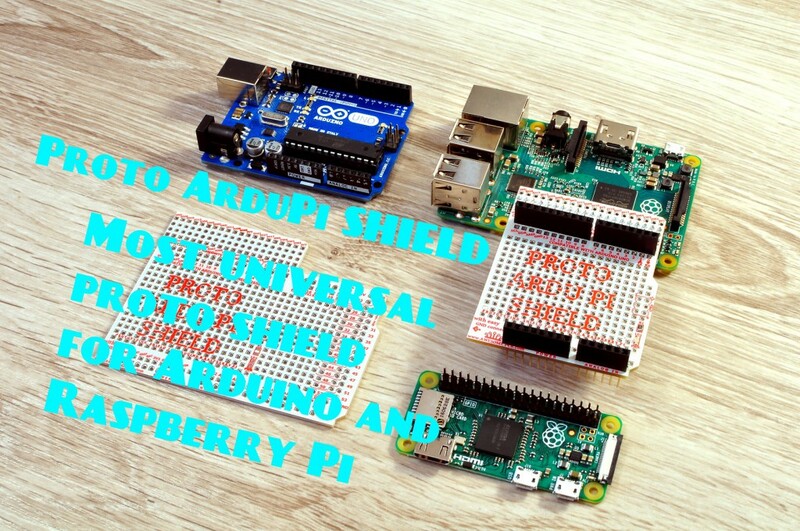 Proto ArduPiSHIELD it is a universal prototyping shield for Raspberry Pi and Arduino family that make your prototype more manageable then ever before. This board fit prefect to your application whether you are playing with Raspberry Pi or Arduino, or both platform at the same time. These PCB are pretty awesome for prototyping. Your prototypes can be easily transferred to something a little more permanent then the mess of the wire on the breadboard, without having to design dedicated PCB. Beside this they are having more things that you will like to. ProtoArduPiSHIELD come in two version. Smaller one is dedicated for Arduino UNO + Raspberry Pi, bigger version is dedicated for Arduino MEGA + Raspberry Pi. Central area of the ProtoArduPiSHIELD it is a prototyping area with plated through hole with standard raster 2.54mm (100mil) to allowed you to place IC like a opamp, comparator, microcontroler and other type of component like a resistor, transistor, sensors which you usualy used to use in your prototype. One of the great things which simplify your design is that you can directly connect pin to the Ground without any additional wire. Basically this mean less mess on your prototype. Bottom side of ProtoArduPiSHIELD the is flood over with copper plane connected to the GND (ground signal) and it is divided for 4 pins range around dot not covered by solder mask. Just solder desired pin with dot, and done. Those two fact give ability to easy connection each pin on the prototyping area to GND signal when you needed. From another side to make soldering easy if you solder pin from opposite side then GND dot you will avoid random shortcut with GND point. This shield make your prototype more manageable then ever before – less wire to the the ground. You can easly find a name of each pin whether it is Arduino or Raspberry Pi. You don’t have to look in to documentation especialy when you are making prototyping with Raspberry Pi because pins are not supported with silkscreen on original boards. An additional row of pins area of pins that you can use to make additional connections. Proto ArduPiSHIELD have additional rows of the pins for Raspberry Pi as well for Arduino. Around whole design on the bottom site of the Proto ArduPiSHIELD there are place for SMD packages (0402, 0603, 0805, 1206). Those footprints allowed you to use SMD components in your prototype, and easy connect them with prototyping area. Time to time it is not possible to use other type of components then just SMD, or just simply you don’t have THT on your stock. There are also universal solder pads around shield, which can be also used like a place for diferrent type of SMD components. Also with little bit soldering skills you can also used SMD components on throu hole area. If you already have ArduSHIELD you can gather all benefint from it with ProtoArduPiSHIELD, and you can still use your Arduino Uno, Mini, Micro, Nano, Pro Mini, Zero and much more compatible bords which out there created by great Arduino Community of people. Full description of pins for Arduino Mega. If you are experimenting with Arduino MEGA, you probably noticed that part of the pins are not described on it. With ProtoArduPiSHIELD you will clearly know which pin is where. On the ProtoArduPiSHIELD ther is a place for power status LED, Which give you indiation that you are connected to power supply when you are testing your prototype.